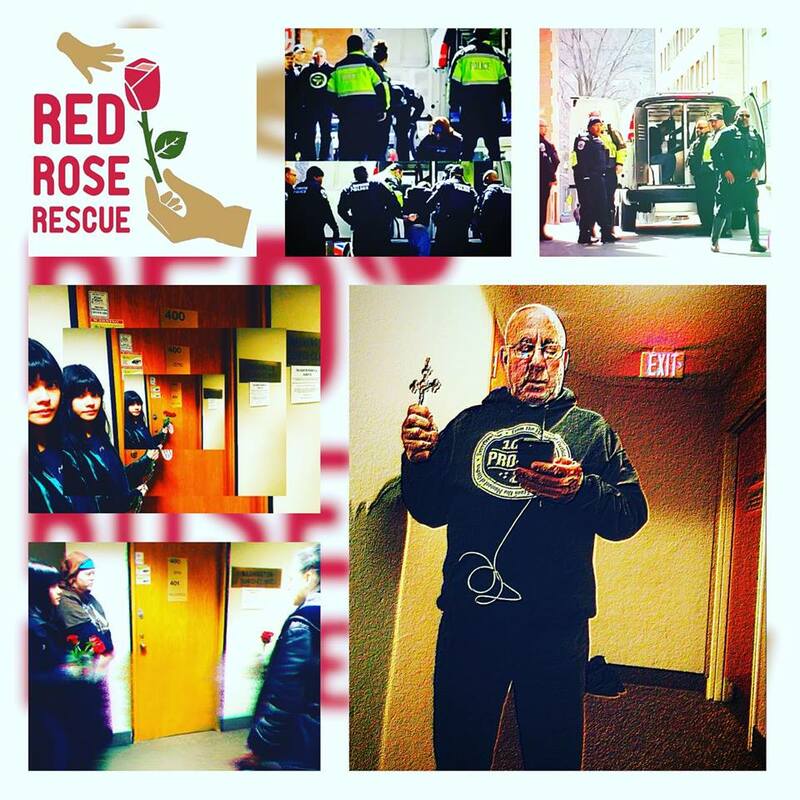 Overturn Roe: Red Rose Rescue In Washington D.C.
Washington, D.C.- On March 19, 2019 Bud Shaver of Abortion Free New Mexico joined 9 others in our nations capital in what is known as Red Rose Rescues. Two rescue teams, led by Catholic priests, entered two Washington D.C. abortion facilities Tuesday morning. Pro-lifers quietly approach mothers scheduled for abortions and offer them red roses as a symbol of life…thus the name “Red Rose Rescue.” Attached to each rose is a card which states: “God is love and he loves you and your unborn baby. Don’t be afraid. 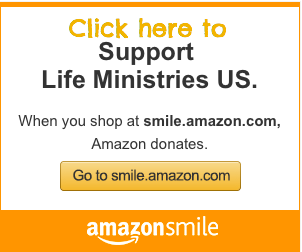 Your life circumstances will change and this baby will give you boundless joy… There is help for you and your baby.” The reverse of the card contained phone numbers of local pregnancy help centers. In doing so, each of the pro-lifers risk arrest for trespass and possible incarceration. They also prayerfully witness to moms, their escorts, the medical workers, and law enforcement who arrive on the scene. Several of the rescuers, including Bud, remained in the facility until arrest, prayerfully standing in solidarity with the babies scheduled to die in that location from abortion. Fr. Stephen Imbarrato led Bud and three other women into Washington Surgi-Clinic located at 2112 F St NW Suite 400, Washington DC, 20037. Washington Surgi-Clinic is one of 19 abortion facilities in the DC metropolitan area. Also known for providing later abortions, Cesare F. Santangelo, has a history of medical malpractice. Court documents obtained by Operation Rescue showed a 2011 medical malpractice/wrongful death lawsuit filed by the family of a woman who died during an abortion. Red Rose Rescues serve multiple purposes, to save babies lives by reaching the moms sitting in clinic waiting rooms, to be present in these killing places in solidarity with the babies who will die and the arrests that occur could be challenged up to the Supreme Court and be the catalyst for the highest court in our nation to overturn Roe vs. Wade. When Roe vs. Wade, the landmark case that decriminalized abortion in our nation, is overturned, performing an abortion in New Mexico becomes a fourth degree felony! It is for this reason that radical leftist democrat legislators in Santa Fe sponsored HB 51. This bill sought to remove New Mexico’s criminal abortion statute, most of which is not currently being enforced because of Roe. However, the existing criminal abortion statute, positions New Mexico to be one of the most pro-life states in the nation. Pro-lifers, especially those in New Mexico, must work to ensure that Roe vs. Wade is overturned so that our state moves from being the late term abortion capital in the nation to a safe haven for the pre-born. Bud Shaver, Lauren Handy, and Fr Imbarrato being arrested at Cesar Santangelo’s late term abortion facility after CLOSING IT DOWN for 5 HOURS. Fr. Imbarrato, Lauren Handy, and Bud Shaver were arrested at around 1:30 p.m. for their Rescue at Washington Surgi-Clinic. Grace Woo and Linda Mueller were not arrested. Fr. Imbarrato and Bud Shaver were released later on Tuesday, Lauren Handy spent the night in custody and was released Wednesday. They were able to shut down the abortion center for 5 hours. They will be in court for a status hearing May 14. “I stand in solidarity with the Red Rose Rescue participants and today join in their peaceful efforts in Washington D.C., our nation’s capital. My prayer is that through this unified, peaceful and sacrificial witness, the hearts of those who go to kill their children will be changed and they will joyfully receive the responsibility of parenthood by choosing life for their babies. 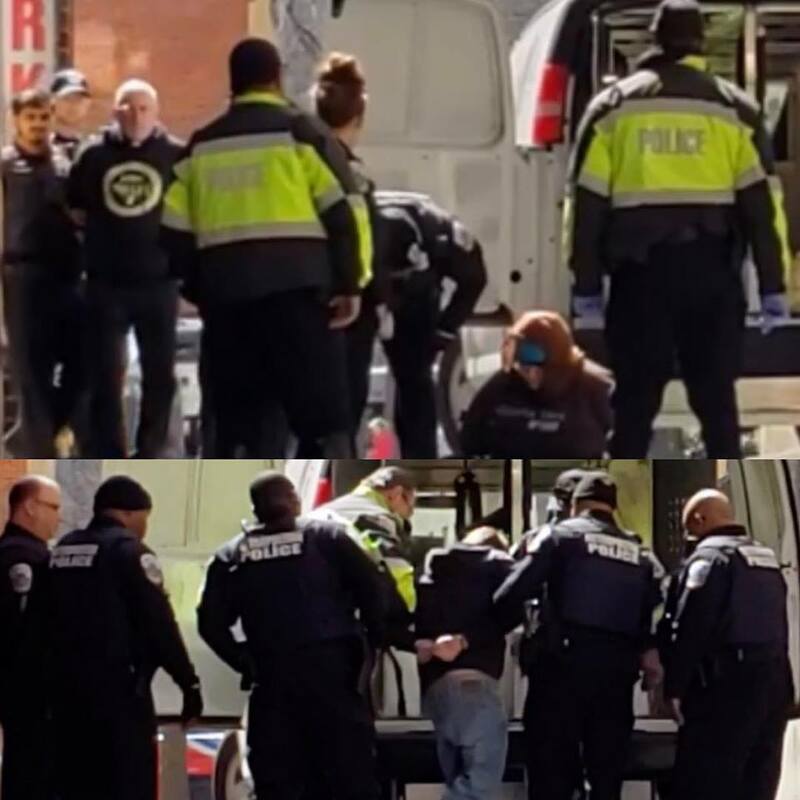 Fr.’s Moscinski and Imbarrato, who led the March 19, 2019 Red Rose Rescues in Washington D.C. have been arrested several times prior, attempting to peacefully save preborn babies from death as have the majority of pro-lifers in today’s activism. Red Rose Rescues began in September 2017. The March 19, 2019 Washington D.C. saving efforts mark more than a dozen in a little over 10 months. Red Rose Rescues are known to have saved numerous babies’ lives from abortion as well as untold numbers of babies who may have been saved because women are not able to keep their appointment when these rescues occur. Rescuers have been known to remain in abortion facilities up to 3 hours praying, singing, counseling women, and witnessing to medical and building staff, and law enforcement. This is the 5th and 6th rescues in Washington DC, the 4th rescue at Capital Women’s Services and the 2nd at Surgi-Clinic. Three of the previous DC rescues brought no charges against the rescuers. Two other rescues that occurred in the greater DC area, in Alexandria Virginia, at the Landmark Towers Alexandria Women’s Health Clinic are thought to have had a role in that facility moving to another location. There have also been rescues in Michigan (2), New Jersey (2), and Albuquerque (1). Albuquerque, NM- The legislative session in New Mexico is officially over! Chairman Steve Pearce of the Republican Party of New Mexico issued his thanks for all of the valiant efforts made by everyone. 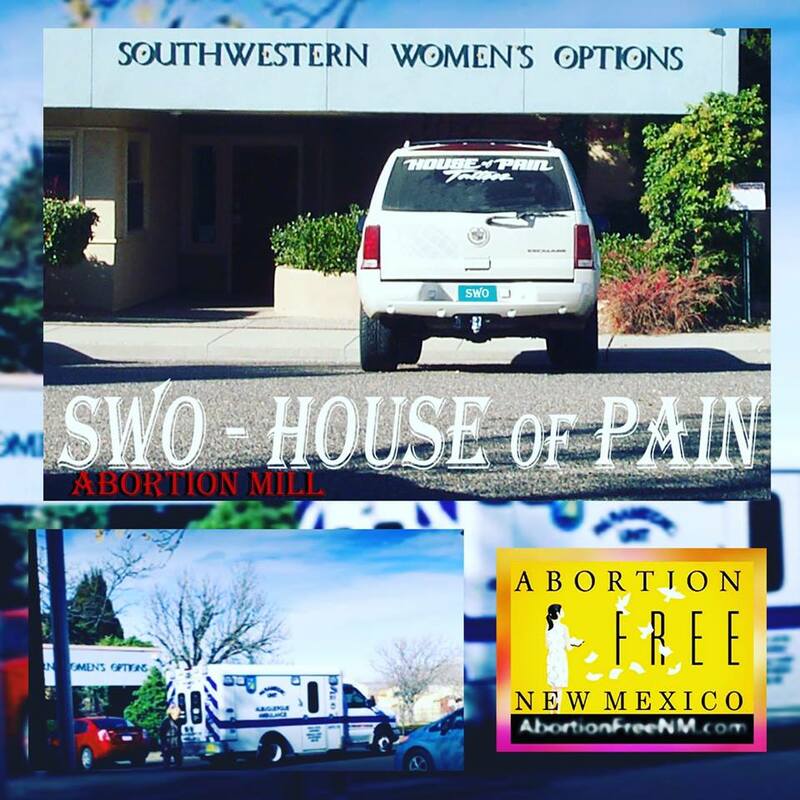 Abortion Free New Mexico laid it all on the line for the babies and against the seemingly insurmountable odds this session. With the democratic party in total control of both chambers of the legislature and the power to sign any law into effect with newly elected governor, Michelle Lujan Grisham a radically pro-abortion democrat, we knew that if there was to be any hope of opposing their PRO-DEATH AGENDA, it was vital to activate the voice of the people of New Mexico and reach the hearts of the Catholic Democrats and urge them to vote their faith. We hit the ground running several months before the legislative session even began by laying the foundation for our primary focus, reaching the hearts of Catholic Democrats. 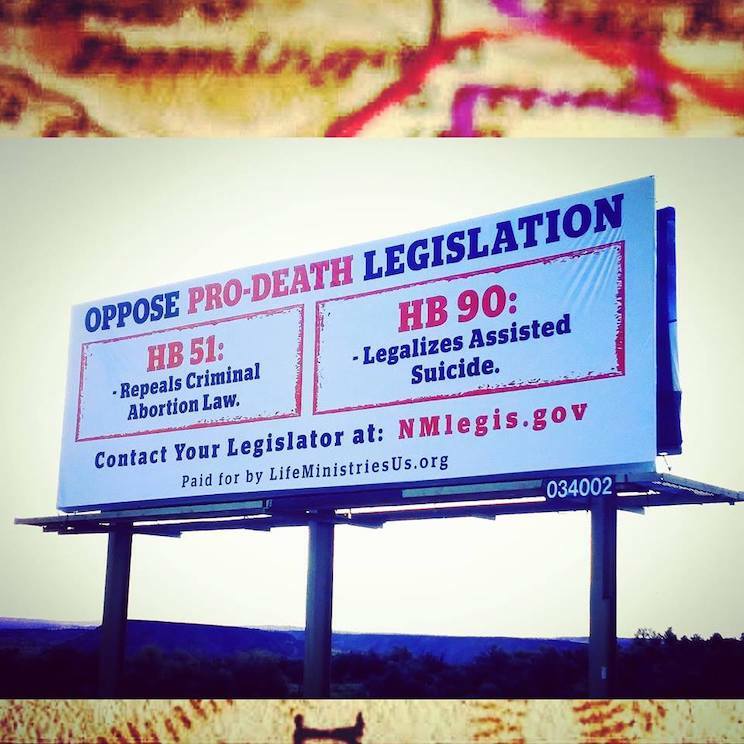 This article in the Church Militant on November 21, 2018 documents our efforts well before the New Mexico 2019 legislative session began on January 15, 2019. “Pro-abort Democrats in New Mexico are seeking to overturn the state’s ban on abortion in advance of a possible overturning of Roe v. Wade by the U.S. Supreme Court. And the Bishops of New Mexico stepped up in a big way in defense of LIFE! In addition to several official statements from the Bishops, the Archdiocese of Santa Fe organized a prayer vigil at the Rotunda of the capital building and welcomed members of all faiths including all advocates for LIFE to join Archbishop John Wester ​in prayer for God to intervene and move the hearts of the democrat legislators to OPPOSE PRO-DEATH LEGISLATION. “New Mexico already allows abortion up until birth. The current bill would remove a criminal ban on abortion that remains on the books since before the Supreme Court’s invention of a right to abortion in Roe v. Wade in 1973. 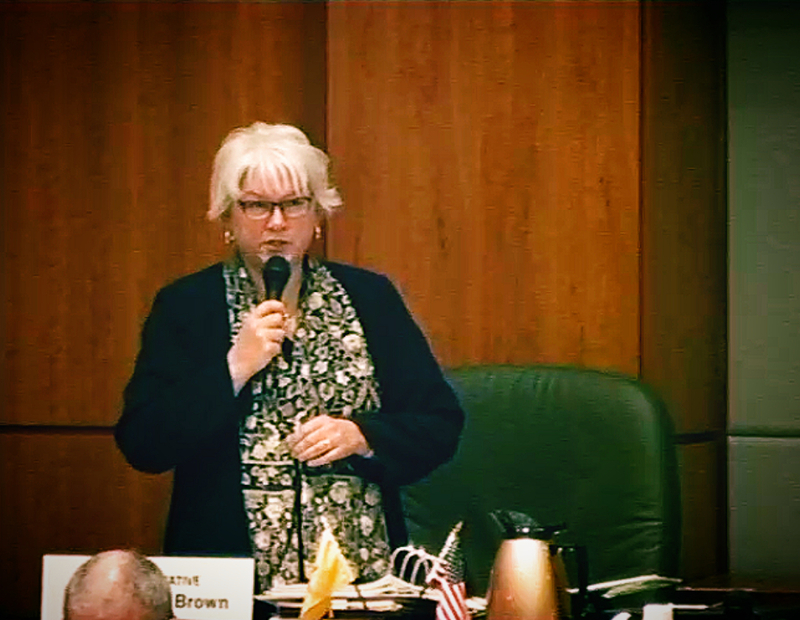 Rep. Cathryn Brown (R-55) stated during debate on the House floor as HB 51 was being debated that in her 8 years of serving in the legislature she has never heard such a public outcry from her constituents in opposition to a bill. 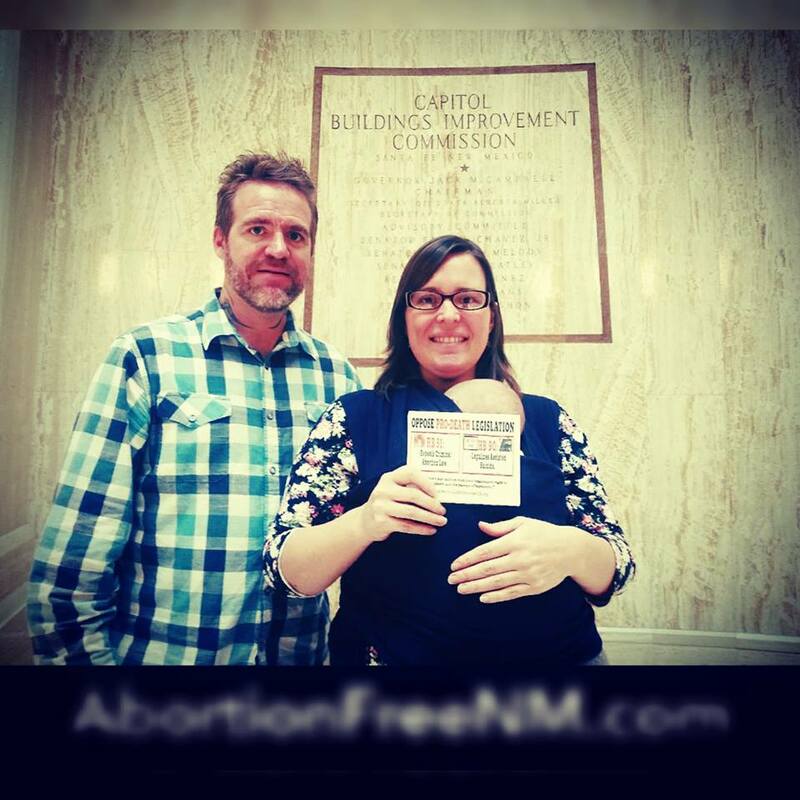 In addition, on the first official day of the session on January 16, 2019 Bud and Tara Shaver of Abortion Free New Mexico hand delivered 112 postcards to all 70 Representatives in the House and all 42 state Senators urging New Mexico state legislators, both Democrat and Republican, to OPPOSE PRO-DEATH LEGISLATION. 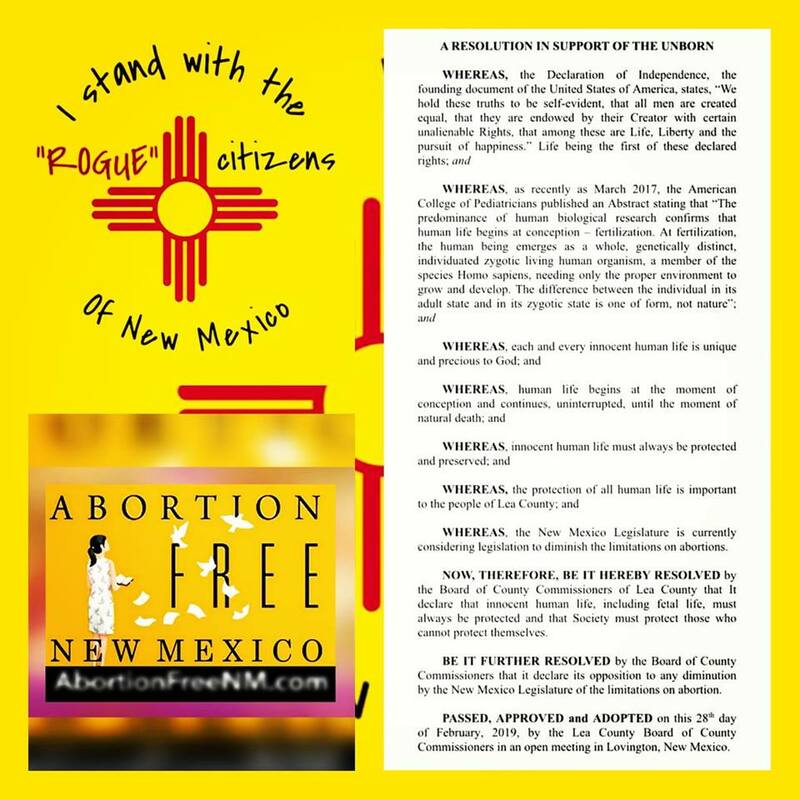 During the 2019 session, Abortion Free New Mexico stayed on top of which committees the bills were assigned to and urged the pro-life community to contact the committee members and their legislators personally in person and via phone and email. They were also encouraged to testify at the committee hearings. Tara urged legislators on the committee to VOTE based on a well formed conscience and encouraged them to utilize their faith as the basis of OPPOSING the pro-death legislation making its way through the legislature. She stated the leftist progressive legislators have no problem invoking theirs to push their radical agenda! 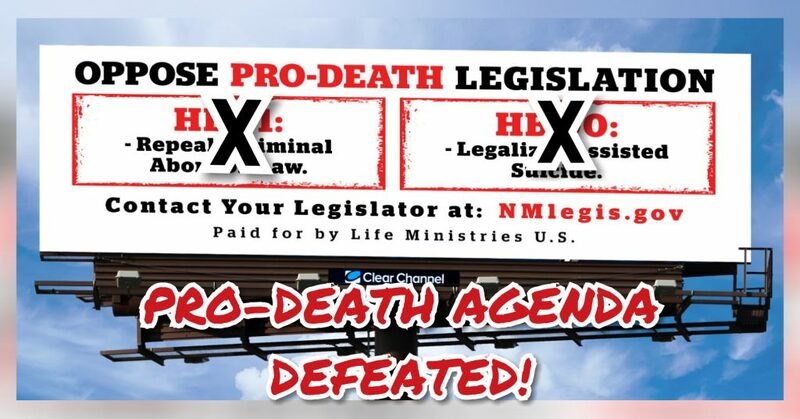 During the 2019 legislative session, Abortion Free New Mexico continued our efforts to document and expose the atrocities aren’t a matter of debate, but are a matter of life and death! 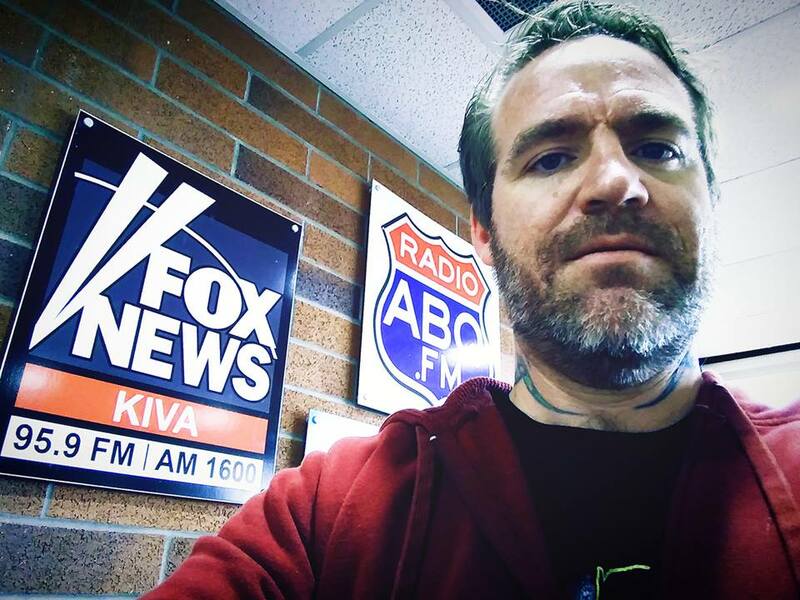 Bud Shaver of Abortion Free New Mexico joined “The Rock of Talk” Eddy Aragon on Fox News Radio to talk all things abortion in New Mexico, the Late Term Abortion Capital of…the WORLD and to help educate and energize New Mexicans to contact their legislators . 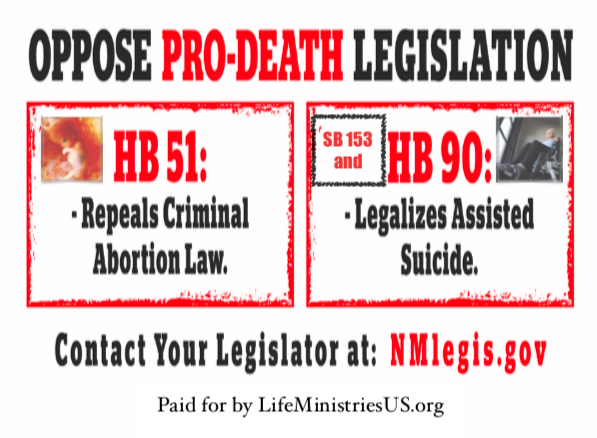 During the session, some were trying to capitalize on the growing national outrage concerning late-term abortion and infanticide, HB 51 didn’t even have anything to do with either of those things, in fact New Mexico is already known as the late-term abortion capital of the WORLD. With HB 51 DECRIMINALIZE ABORTION, the pro-aborts were anticipating the Supreme Court of The United States overturning Roe vs. Wade (due to President Donald Trump’s excellent appointments to the bench and potential future appointments). When that happens the current 1969 criminal abortion law would be in immediate effect! 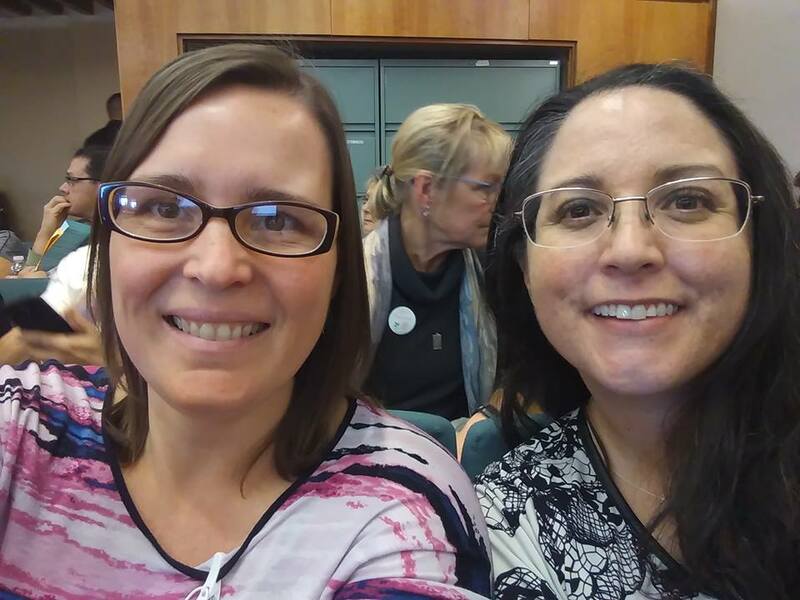 One of the most encouraging developments during the 2019 legislative session was the connection that Abortion Free New Mexico was able to make with the Patriot community of New Mexico. We were proud to stand together and protest at the capital against the push by fringe leftist democrats to destroy the values that most New Mexicans hold so dear. Patriots from all across New Mexico joined their issues together as one voice for prayer for New Mexico and to support President Donald J. Trump, stand up for LIFE, the Constitution, the Second Amendment, Free Speech, the Wall and AGAINST illegal immigration, rigged elections, higher taxes and corruption running rampant in New Mexico! 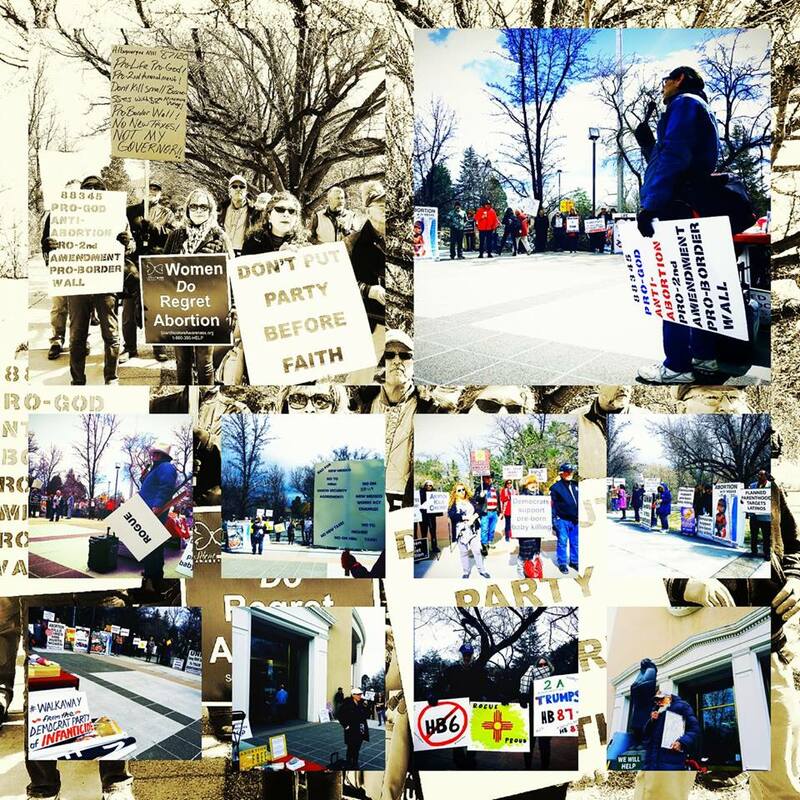 Our voices reverberated throughout the state Capital and our presence did not go unnoticed! In fact, two elected officials: a state representative and a state senator, were compelled to join us in protest and shared words of encouragement! Abortion Free New Mexico would like to thank all of the the statewide organizations who mobilized their base to oppose HB 51, everyone who called/emailed their representatives and testified in Santa Fe, and those who financially supported our billboard and statewide postcard public awareness campaign. “It is truly miraculous that HB51 and HB 90/ SB153 did not pass through the New Mexico legislature currently controlled by the Democrat party. All glory to the Lord and thanks to so many who took action this legislative session! Did you know that New Mexico is positioned to be one of the most pro-life states in the nation when Roe v. Wade is overturned? HB51 would have removed our criminal abortion statute and brought us to square one with no laws restricting abortion. Please continue to pray and be engaged in this battle for the lives of precious pre-born babies targeted for death in the late term abortion capital of the nation. Roswell, New Mexico becomes a Sanctuary City for the UNBORN and TWO New Mexico Counties become Sanctuary Counties for the UNBORN: Lea County and Hidalgo County! BREAKING: ROSWELL, NM BECOMES A SANCTUARY CITY FOR THE UNBORN! GOD BLESS ROSWELL, NEW MEXICO! 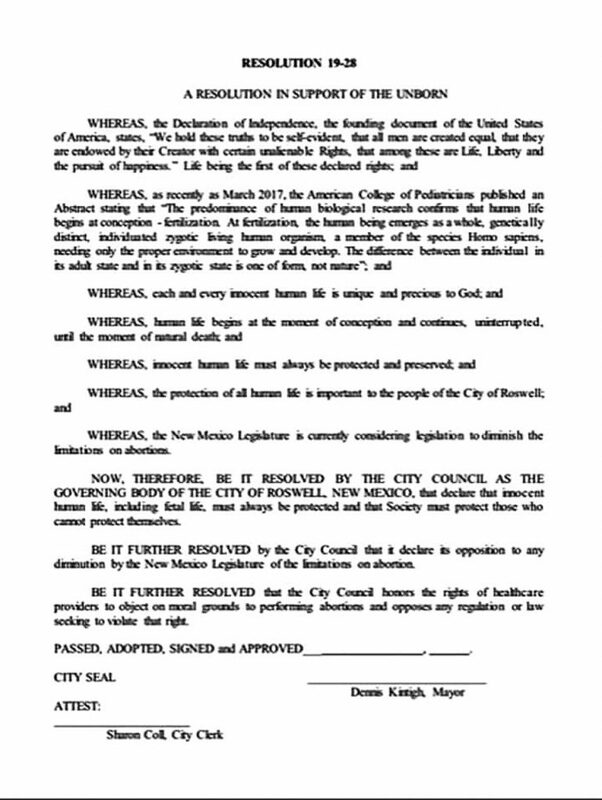 Roswell, NM- BREAKING: ROSWELL CITY COUNCIL VOTED TONIGHT THURSDAY, MARCH 14, 2019 TO BECOME A SANCTUARY CITY FOR THE UNBORN!